Why aren't you prepared to share more risks with your clients, Mr Provider? If I have to hear another advisor, lawyer or provider sales executive whining about their lack of business, I am just going to tell them straight - "You're a dinosaur, you are selling a capability from a bygone era. The reason clients don't call you anymore is because you are not offering them what they really need - or at least educating them on what they need to haul their legacy back ends out of the dark ages." The narrative simply has to change. Today's enterprise world is littered with literally hundreds of legacy outsourcing relationships where the service providers are unwilling (and many just plain incapable) of making any genuine productivity improvements. The problem we have, today, is that the leadership within many enterprise "buyer" clients is under huge pressure to take their operations to the next level, but most of their middle and lower management clearly only care about keeping the current status quo. In a nutshell, our industry is suffering from hundreds of stagnating outsourcing relationships, where the service provider has zero incentive to do anything much beyond keeping the margins consistent, while the middle management on the buy side has a similarly lethargic ambition not to do anything much... bar keeping the lights on. 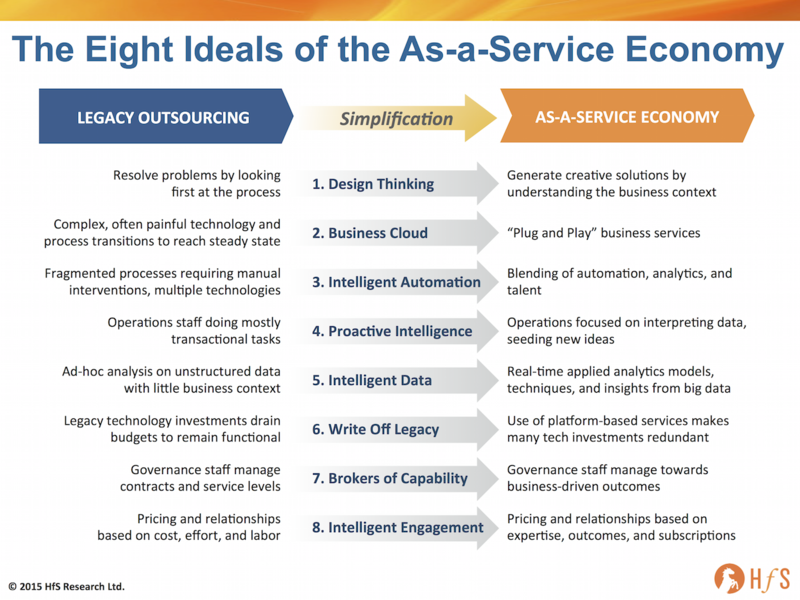 The reality today is that senior buyer executives want to progress the operating model towards As-a-Service, while their counterpart service provider leaders are talking a big game about delivering Digital and As-a-Service capabilities to their clients, which can spread the wealth generated by better automation, actionable analytics and a multi-tenant model. Hmmm... reminds me a bit of outsourcing 1.0, where the leaderships in many enterprises dove into outsourcing fuelled primarily by lower cost labor, forcing the situation on their underlings. Now a similar pattern in emerging, with the difference being the "tangible" productivity factor is automation, while access to better, more actionable data to make business decisions the ultimate desired outcome. The challenge today, quite simply, is less of an appetite from the sell side to absorb the risk. Making savings through automation is a lot more "risky" for many providers than the ease of swapping out bodies. However, taking these risks, and investing in the talent and technology to de-risk these situations, is what is key to survival. Most service providers, while talking a big game, are not convincing their clients they are really prepared to share risk and make genuine investments to build out a true multi-tenant As-a-Service delivery capability. That's probably because they only really care about making their quarterly numbers, not having a sustainable, well-planned long-term strategy. This situation spells a near-certain recipe for failure for the outsourcing industry, where the decision-making layers claim they want to shift the gears, but the existing relationships are clearly stuck in a depressing holding pattern. In fact, from many client discussions we are having today, execution from certain providers (you know who you are) is deteriorating further, as they simply cannot say no to the increasingly complex needs of their clients, but are too stingy (or should I say cannibalistic) to invest in better talent and capabilities to up their game. It's a situation that is going to end in outsourcing failure for many, if steps are not taken to arrest this decline in delivery quality, and investments made in future capability - most notably robotic process automation, real time analytics solutions and a roadmap for self-learning and artificial intelligence. Those providers with these capabilities can break this cycle by building multi-tenant solutions for the future - and will be the winners. I believe this could happen in barely a couple of years, when you look at the current pace of change and mood in the market. The key is to pick off the next 15-20 deals they can win at lower margins in order to invest in common automation, common analytics, common SaaS underpinnings and common service skills - hence a more competitive, more scalable multi-tenant As-a-Service delivery model. 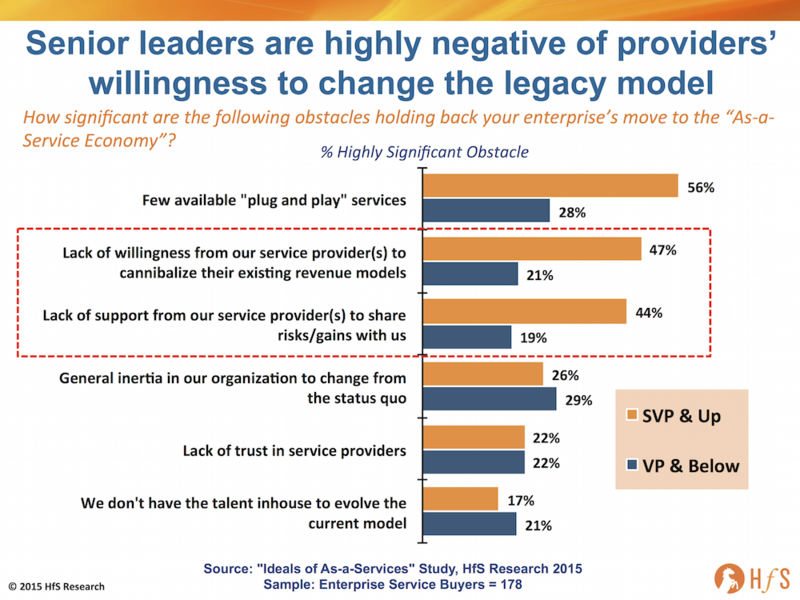 It's easy to point fingers at certain service providers for preserving the legacy FTE labor model, but the stark reality is that many of them simply don't have leadership prepared to invest in the depth of talent, or technology capability to drive genuine advancements. So - let's face facts here - we're at an impasse. There are tremendous opportunities to create genuine productivity advancements through robotic process automation, smarter analytics and the onset of cognitive computing, but much of the present service provider bunch are not going to be the ones to take true advantage of them. I predict a few will break out, but the next winners will be from a new breed of As-a-Service provider, many of whom many not even have been formed yet. The conundrum is simple. The future models of outsourcing are going to be more efficient and will require stronger outcome guarantees. As a result, they will generate lower revenues and generate more risk for service providers, but the profitability should be solid. Further, operating a service requires investment and R&D that isn't going to be directly funded by clients. The outsourcing service providers' currently assumptions around revenue growth, profitability and sources of investment are all completely at odds with the future's reality. Buyers are willing to go down the path, but the service providers don't have viable capabilities or commercial constructs to handle it. This isn't just a board room issue. There are two decades of outsourcing middle management lingering in the ranks of the service providers who aren't ready to manage this change because 1) they lack the skills and 2) most of these account managers/client/operations leads will lose their jobs (you don't need leads that support client-specific teams in a service model). This is a stark warning for service providers refusing to re-engage with their clients which have fast become legacy relationships. While some clients are just flat-out unprofitable, I am seeing several with high future potential that service providers are overlooking because they don't throw off enough easy margin with FTE arbitrage. Having just completed a negotiation around these "As A Service" principles, here's what I can tell you that might explain both the challenges and the solution. The Providers, while talking the talk, say that Client behaviors are not aligned with the notion of buying market-bases, standard, multi-tenant, services. Supply Chain and Sourcing folks continue to insist on "fill out my form and build to my specs" mode of buying. 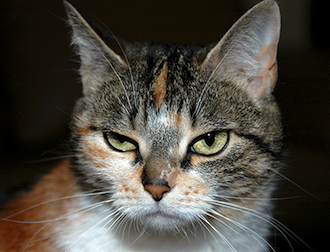 Conversely, the Clients are disappointed at the behaviors that you outline. These, generally characterized, reflect a half-hearted commitment to bringing scaled, leveraged offerings to the table. My recommendation to the established Providers is to pick battles. Find scope of service where there exists sufficient commonality among multiple Clients and proactively bring a new value proposition to those captive customers. That'll test the demand among the most informed buyers, and also call to question the true willingness to move away from bespoke contracting. First of all, ‘selling a capability from a bygone era.’ Believe it or not, there are plenty of organizations (clients) that are still approaching transactions this way. However, they have created internal organizations such as ‘Indirect Sourcing’ or ‘Strategic Sourcing’ whose sole job is to perform these transactions because they did it once before. If they hire outside support, their executives question why they exist. Not only that, they can get just about anyone’s templates and so called ‘IP’ on the internet. You just have to know where to look. Therefore, why do I need an Advisor that is going to tell me the same thing I can get for free. There is a much deeper discussion around transformation as I see many large enterprise companies are struggling to move this concept forward. Second ‘dinosaur’ - I am not sure I would call them dinosaurs rather that they cannot clearly articulate the new narrative. I do believe the larger Advisory and Legal firms have not grasped the ‘new realities’. They have become like their largest clients and have lost the creativity, nimbleness and flexibility it takes to be successful. They are still relying on past practices that are becoming less relevant. Regarding the ‘service providers are unwilling of making genuine productivity improvements’. This is a subject that has many aspects. First, I have found that in several cases the service provider has offered improvements but the client doesn’t believe it because the service provider wants money to perform the improvement. The client feels the risk is too high and the benefit low. In other cases, the service provider community is grappling with this because they have to cannibalize their current revenues for that client. With companies reporting results to Wall Street this becomes a problem because they start missing numbers. Yes, this is a short term view and it is caused by the stock market. So you need senior executives willing to take those hits. Finally, regarding this matter, even though ‘senior’ executives are highly negative, I find that the narrative is being created by ‘middle’ executives (clients/providers) with no resolve to effect the changes. They have become very risk adverse. Finally, I agree that many senior executives want to give the service providers more high-value services. However, I am not sure it is always the fault of the service provider that it is not happening. Again, the roadblocks are those underneath them, probably on both sides. I do believe that some of the service providers are investing ‘AAS’ and becoming more scalable, but I see a real reticence by the clients because of ‘security’ and multi-tenant… In my opinion, these are just excuses to not move forward and ‘embrace’ change. What is even worse is that the service providers don’t know how to sell it… Many of the traditional services providers continue to talks about FTE models and it drives me crazy, but that is all they know. In fact, the Indian service providers seem to only think this way. It is all they know, because for them it is all about labor arbitrage. Unfortunately, it is the Advisor community that made them think this way and there are still some out that espouse this thinking. That comes back to the opening paragraph of your article. The clients think they have a sourcing organization and the Advisory and Legal firms in some cases cannot get the client to understand ‘Outsourcing 2.0’ because many of them don’t understand it themselves. So, now that I have finished, there are a lot of ‘dinosaurs’ out there and they are not helping either the client or the service provider community to move the industry forward. One more point to make here. There are a lot of 1-10 person ‘so-called’ Advisory firms out there that are out of touch because they live in the past. They are continuing to use old ‘IP’ and practices because that is how they grew up, don’t have the time to re-think our industry because they have to always be with a client to survive and frankly many clients don’t know any better or have an existing relationship. This is hurting the industry as much as the larger guys who think they know everything. Bottom Line on ‘the outsourcing industry is stuck in a legacy holding pattern and is in real danger of decline’ ----- It is in a legacy holding pattern until executives realize that their own people are keeping them from advancing and the service providers show ‘actual thought leadership’ and execute on it. Frankly, I am not as negative on the ‘decline’ because there is still a lot going on, it is just that when companies think of ‘outsourcing’ they are still living in the past. For the Advisors and Legal companies, education is going to be the key to their survival and ongoing growth. This is one of my favorite blogs of late. I think the “mutual extinction dance” that legacy providers and legacy buyers may be locked into could give birth to new players (and soon-to-be-big ones) on both sides of the transaction that will simply leave the legacy buy/sell laggards as frozen tableaux and object lessons for the slow of foot. We may be witnessing the making of a services Chernobyl that will become a mausoleum of missed opportunity and a cautionary tale for future generations. Just look at the way SaaS companies like Workday and Salesforce have infrastructure and services partners that are themselves SaaS players - and thus the future is being built in the cloud and for the cloud. The world may not long remember the legacy outsourcers and their equally legacy clients, last seen arguing over FTE prices while the emerging world (filled with robots, shared investment, cloud apps and smart services) passed them by. That feels right to me – this is how you turn a big ship around and that is what is needed. Those who do will own the future, those who don’t will be gobbled up, fail to thrive, or go extinct. It’s that stark, but not that visible yet. . . except to HfS. . .
@Anon Dinosaur - this has to be the Quote of the Week: "We may be witnessing the making of a services Chernobyl that will become a mausoleum of missed opportunity and a cautionary tale for future generations"
I agree with your points based on the experiences we are seeing as well. The absence of a "service product/offering management" skillset in the providers is starting to show. Its hard to deliver on this multi-client scaled as-a-service capability if you leave the solution power at the individual client level and you don't invest in the skills and organization to create offerings that scale. Not to be overly psycho-retro-analytical on this, but I can't help but look for root causes as a means of determining how we might overcome the issues. I fear the root issues are largely genetic. Both the buyers and the providers have developed muscles around "systems integration" (requirements-oriented, build-to-spec, etc.) or "staff augmentation" (lower-cost resourcing). The current "As A Service" trend largely reflects a "product management" orientation. Taken together, these are three very different genetic makeups. We've seen systems integrators morph to add staff augmentation. And, we've seem staff augmentors build systems integration muscle. The question for today: can these companies develop the product-oriented capability that is required, or will a new breed arise? Genetic issues are insidious. The most difficult to overcome - largely requiring a generational intervention. This post and the comments that follow took me on something of a sentimental journey. In the late 80’s/early 90s as director of a research and executive education program called the Institute for Information Studies, I had the good fortune and the great pleasure of sharing several conversations with Alan Kay, one of the fathers of personal computing at Xerox PARC. (I suppose that makes me a dinosaur…LOL…). Among many gems of wisdom, Alan often observed that “very few companies have the capability (or the courage) to do two interesting things.” By that he meant they became imprisoned by the discovery or the event or the business model that made them successful and simply couldn’t recognize or accept the possibility of a different (alien?) model. Xerox didn’t understand or appreciate the potential of the PC because it didn’t look much like a copier. Apple came along and the rest is history. I think Peter nails it in his most recent comment – it’s deeply genetic, and the genome is fixed at birth. Adaptation is the key to survival but not all species adapt. Sometimes it takes longer than we want or expect, but Darwin rules in the end. SaaS or not, operational transformation is a necessity and costs money. A fanatical focus on the next quarters numbers precludes this. Some clients are attempting to slice out the middleman by in-sourcing based on 'labour-light', 'self-service' and 'out-of-the-box' SaaS services. We know that this will not work, especially for larger global organisations, due to their complex requirements. Hopefully, this will result in a mature conversation and a sharing of investments, risk and reward once a realistic understanding of the situation is reached. · The clients’ responsibility here: they talk about wanting innovation – and if they were insourced, the good organizations would want to deliver it to the business – but at the end of the day budgets get cut and we’re back to keeping costs low for JUST THIS YEAR! There goes innovation / investment in the base case and in the outside service delivery … it’s really a way of the customers confusing their providers with what they want.